Is this the last word on the mysterious Younger Dryas period? It’s an interesting, if not entirely new, hypothesis at least. At the end of the Pleistocene period, approximately 12,800 years ago—give or take a few centuries—a cosmic impact triggered an abrupt cooling episode that earth scientists refer to as the Younger Dryas, reports Phys.org. New research by UC Santa Barbara geologist James Kennett and an international group of investigators has narrowed the date to a 100-year range, sometime between 12,835 and 12,735 years ago. The team’s findings appear today in the Proceedings of the National Academy of Sciences. The researchers used Bayesian statistical analyses of 354 dates taken from 30 sites on more than four continents. By using Bayesian analysis, the researchers were able to calculate more robust age models through multiple, progressive statistical iterations that consider all related age data. In a previous paper, Kennett and colleagues conclusively identified a thin layer called the Younger Dryas Boundary (YDB) that contains a rich assemblage of high-temperature spherules, melt-glass and nanodiamonds, the production of which can be explained only by cosmic impact. However, in order for the major impact theory to be possible, the YDB layer would have to be the same age globally, which is what this latest paper reports. All together, the locations cover a huge range of distribution, reaching from northern Syria to California and from Venezuela to Canada. Two California sites are on the Channel Islands off Santa Barbara. However, Kennett and his team didn’t rely solely on their own data, which mostly used radiocarbon dating to determine date ranges for each site. They also examined six instances of independently derived age data that used other dating methods, in most cases counting annual layers in ice and lake sediments. Two core studies taken from the Greenland ice sheet revealed an anomalous platinum layer, a marker for the YDB. A study of tree rings in Germany also showed evidence of the YDB, as did freshwater and marine varves, the annual laminations that occur in bodies of water. Even stalagmites in China displayed signs of abrupt climate change around the time of the Younger Dryas cooling event. 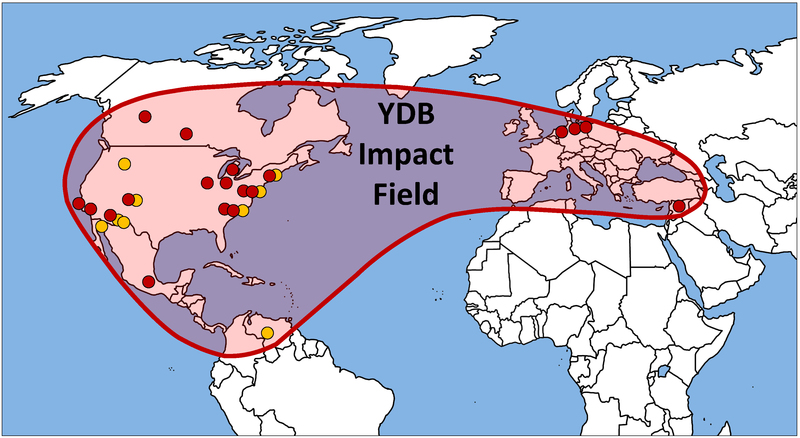 “The important takeaway is that these proxy records suggest a causal connection between the YDB cosmic impact event and the Younger Dryas cooling event,” Kennett said. “In other words, the impact event triggered this abrupt cooling. Phys.org report: A cataclysmic event of a certain age. I just don’t think you can look at the Younger Dryas in isolation against the backdrop of the whole series of very rapid temperature fluctuations which occurred at the Last Termination, beginning with the very rapid warming 14,700 years ago. This was quickly followed by equally rapid cooling, then later the Younger Dryas cooling which lasted a thousand years and then finally very rapid warming once again to bring the world into the relative benign stability of the Holocene interglacial. An impact may well have triggered the YD, but it hardly explains the other very rapid changes which occurred at the juncture between the last Ice Age and the Holocene – of which the YD seems to be an integral part..
You can see what was going on (at least in Greenland) at the time by looking at the GISP2 core. A bit OT but the Medieval Warm Period doesn’t look so warm compared to earlier ‘blips’ on that red line. No, no and NO! The YD was not caused by a cosmic impact and was just one of many abrupt climate changes between 20,000 and 10,000 years ago. The ice dynamic was such during this time period that only small amounts of forcing were needed to send the climate into another climate regime. Yes, quite. Modern humans lived through the huge climatic upheavals which occurred 15k to 10k years ago with just flint axes and campfires and animal skins to keep them warm. Approx.45C accumulated extremely rapid fluctuations in NH temperature and – with all the technology at our disposal – some people insist that we’re in trouble if it rises just another 1.2C in the next 100 years! The data in the above throws out the cosmic impact as being wrong and throws out the melt water from Lake Agassiz as being wrong for why the YD may have come about. Not to mention the YD was synchronous in both hemispheres. So what makes platinum special in this case when an iridium anomaly is reported for the one that allegedly got the dinosaurs? Are these anomalies so small that people are element-fishing down in the analytical noise? The explanation below is for the Little Ice Age and I think it can be applied to the YD, despite the fact Milankovitch Cycles were not that favorable at that time , but the Ice Dynamic for sure was and that changed the whole dynamic of the playing field and is the factor which made abrupt climatic changes to happen so frequently 20000 to 10000 years ago. The YD was just one of many abrupt climatic changes during that time period. This theory combined with my input for how the Little Ice Age may have started can also be applied to the YD, with the big difference being the all important Ice Dynamic at the time of the YD ,which made the climate more vulnerable to change with much less forcing. This article is good but it needs to emphasize the prolonged minimum solar /volcanic climate connection( which it does not mention ), and other prolonged minimum solar climate connections such as an increase in galactic cosmic rays more clouds, a more meridional atmospheric circulation due to ozone distribution/concentration changes (which it does not do ) which all lead to cooler temperatures and more extremes . In addition they do not factor the relative strength of the earth’s magnetic field. When this is added to the context of this article I think one has a comprehensive explanation as to how the start of the Little Ice Age following the Medieval Warm Period may have taken place and how like then (around 1275 AD) is similar to today with perhaps a similar result taken place going forward from this point in time. I want to add the Wolf Solar Minimum went from 1280-1350 AD ,followed by the Sporer Minimum from 1450-1550 AD. This Wolf Minimum corresponding to the onset of the Little Ice Age. John Casey the head of the Space and Science Center, has shown through the data a prolonged minimum solar event/major volcanic eruption correlation. Today, I say again is very similar to 1275 AD. If prolonged minimum solar conditions become entrenched (similar to the Wolf Minimum) accompanied by Major Volcanic Activity I say a Little Ice Age will once again be in the making. Milankovitch Cycles still favoring cold N.H. summers if not more so then during the last Little Ice Age , while the Geo Magnetic Field is weaker in contrast to the last Little Ice Age. I would not be surprised if the next Little Ice Age comes about if the prolonged solar minimum expectations are realized in full. Must abrupt climate shifts at the beginning of an interglacial (which seemed to begin ~20,000 ya), similar to other abrupt climate shifts we know a lot about, automatically rule out comet/asteroid impact? This extreme arguing back and forth does not seem productive. Why not put all the evidence together, cooperatively? You will see that very rapid rise in temperatures at the end of the YD almost perfectly coincides with a Dansgaard-Oeschger (DO) event about 11,000 years BP. What Jaime said at [July 27, 2015 at 10:51 pm] above pretty much sums up what I am saying. I believe that the abrupt temperature changes seen in the Greenland Ice data were caused by DO event. I (along with others e.g. Chefio) propose that the DO events are driven by the peak Perigean lunar tides. It the regular DO events [roughly once every 1470 years] that are causing the temperature fluctuations that we see as the World transitioned from the Ice Age to the Holocene. It is as though the world’s mean temperature had to be jump started (by DO events) a number of times before the Holcene fired up and produced the current inter-glacial. So, what is a Dansgaard Oeschger event apart from being a period of climatic anomaly. Nobody knows what caused such occurrences – its all pie in the sky. Same with the Heinrich events. You can waffle as much as you want but the non-impact people only have theory on their side – not facts. The impact people have proof of the pudding. The one consistency in all the endless arguments, as occurred at Watts post, is that some people have their brain logged in to oppose impacts at any cost. They are dogmatic and not at all open minded. Let’s agree that we don’t know what caused the Younger Dryas and hope that scientists will get out there and have a look. Simply coming out with I don’t believe this or that is not science. That is dogma. Not only that I think you will find that an impact event is not part of the YDB argument now – it has moved on. It revolves around the Earth entering a region of space that was full of dust and debris from the passage of a large comet. It may alternatively have involved the earth entering the tail debris of a comet and experiencing multiple Tunguska like episodes (the Clube and Napier theory of the 1990s). No actual scenario is set down in stone. All they are suggesting is that there was some kind of cosmic event. Why is that so difficult to comprehend. We are a rock in space that has lots of other objects whizzing around – just look at the discoveries of NASAs near earth object survey. Whilst most of these are in resonant orbit and no danger you have to take into account that some of them are composed of more than one object with the smaller one in resonant orbit with the larger one. Therefore the smaller object is not in resonant orbit with the earth and presents a danger when the bigger object comes close (witness the Chelyabinsk meteor). These things happen. Why is it so difficult to think about it happening at the YDB? Looking back over the last 5 million years, the global climate has become a lot more noisy, in addition to it generally cooling. Ice Ages are very much a feature of ‘recent’ global climate and indeed, represent the ‘norm’, with brief interglacials being very much a temporary departure from that norm. This might suggest an extraterrestrial origin for the Ice Age cycles; extraterrestrial conditions which were not a feature of Earth’s earlier history. Galactic clouds of dust spring to mind, though the variation in insolation may be directly related to something happening to the Sun (less likely, as I believe the Sun has generally increased in brightness compared to millions of years ago). So glacial temperatures are ‘normal’ for earth at the moment and the clue to the rapid fluctuations in temperature at the beginning of the present interglacial almost certainly lies in investigating what caused the rapid global warming spike which effectively ended the last Ice Age. We should probably not be excluding extraterrestrial or terrestrial causes for rapid climate change at Ice Age/interglacial cusp periods – it’s likely that they are linked in a complex web of interacting causes and effects. It is very likely that the lunar orbit partakes in the ~ 26,000 year precession of the Earth’s rotation axis with respect to the stars. When this ~ 26,000 year precession is couple with the ~ 71,000 year wobble of the Earth’s orbit (with respect to the plane of the ecliptic), it produces the well known ~ 41,000 year nodding of the Earth’s obliquity (i.e. tilt of the rotation axis with respect to the plane of the ecliptic). is that the ~ 26,000 year precession of the Earth’s axis of rotation with respect to the stars is synchronized with the slow drift of the 395 orbits : 243 orbits Venus/Earth commensurability pattern with respect to the nodes of Venus’ orbit. Support for this proposal is provided by the fact that it takes ~ 41,000 years for the calendar dates for the transit of Venus to cycle once through the seasonal (tropical) year. This “resonance” between precession of the Earth’s rotation axis and the orbit of Venus (relative the Earth-Sun plane) may have kicked in ~ 3 million years ago producing the 41,000 year and then 100,000 cycles [see conclusion of paper] in the Earth’s polar temperatures. E.M. Smith, chiefio.wordpress.com, has done some extensive reviews of lunar orbital resonances, probably filed under Earth Science. These might be a nice addition to the depth of research here. Thanks, Tallbloke and crew. Definitely not normal in the bigger picture. Seems to be trying like hell to get back to “normal” as the interglacial peaks often extend into the Pliocene range, only to be stuffed back down again. The lower graphic has been around and haven’t heard any comment on its suggestion of a 20C range between the PETM and recent glacial minima.This is remarkable and a different animal from the 6C range often touted for the Phanerozoic. If true, the YD becomes lunch money, whatever caused it. 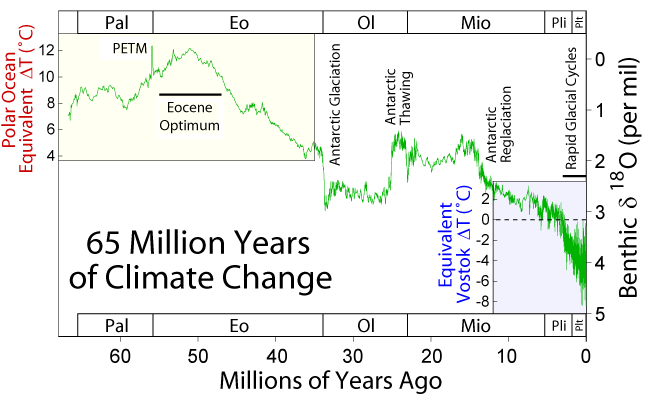 This shows the 1470 year climate cycle if it did exist has not been in existence during the Holocene. I concur with their conclusions. I see no evidence of the 1470 year climate cycle during the Holocene, and if the temperatures trend down over the next few decades this will enforce that conclusion further. Solar variability and the secondary effects was more then enough to bring on the YD, especially if one considers the initial state of the climate at that time for example the Ice Dynamic. I concur with this study. I might as well push my own theory that the Younger Dryas was actually a period of rapid melting of the North American ice cap that caused the North Atlantic to be blanketed with fresh water, with the result that precipitation falling on Greenland originated from evaporation of that O18 depleted fresh water, causing an anomalous low temperature indication in the Greenland ice cores. Could not the the same effects be seen by just our solar system traveling through a particularly dusty part of the universe? It cites a paper finding ocean currents are stable during interglacials, but less stable during glacials so we were metastable at the Younger Dryas. Gulf Stream switches, in effect. This can then explain things like an impact switching back to cold that latches up for another 1000 years. That there was an impact is clear. The question of why a 1000 year effect has been the blocker to that thesis. This mechanism unblocks it. Further, the metastable phase explains the large swing back then, and how small lunar tidal triggers can cause a periodic high / low temp cycle with 1470 ish year period. The 1470 ish cycle is still there, but as Bond Events instead of Heinrich / D.O. couples. It also shows up in the cycles of empires… Cold ends them. Iron Age cold period. Migration Era Pessimum. 4200 kiloyear event (fall of Akkad and the Egyptian Old Kingdom IIRC). And more. There also seems to be a minor cold event at 1/2 that period. So my belief is that one must allow for the 1470 year stochastic resonant cycle, and for the known impact, and for the metastable ocean phase. With that all in mind, we were trying to warm out of the glacial, but with a switching behaviour stimulated by lunar tidal forces (along with some others), then during a warming spike, the rock hit (many big rocks in space are really metal chunks heavy in platinum group metals) and switched us to cold for 1000 years until the next lunar tidal kicker could warm again. By then, orbital changes let us latch up into the interglacial as the ice melted and the stable ocean regime kicked in. Oh, and I likely ought to add that solar changes cycle with this too as, due to orbital resonance, the gas giants set the Earth orbital timing and the lunar cycle and the solar orbital pot stirring (and likely volcanic cycles from tidal kneeding of the crust cycles..,) Basically it is an “all of the above” causality as they are all timed together by the gas giants. Due to that one cannot use statistical correlation to show causality, and trying to say One Causes while the others do not is unproductive. It is a system, not a singular thing. 79 lunar nodal cycles would be about 1470 years, as well as the three-way Jupiter-Saturn-Neptune conjunction synchronization (41 S-N = 74 J-S = 115 J-N = 1470 years). E. Smith the 1470 year climate cycle is not there in the Holocene. Here are the cold periods in the Holocene after the YD. Next one probably coming 2020. I have reached the same conclusions the study below has reached which is a clear cyclicity was not found during the Holocene. Looking at Jamie’s climate chart, it’s obvious something changed about 50 million and 12 million years ago in the average temperature. Given that a pressure temperature relationship exists due to Earth’s atmospheric density, is it reasonable to speculate that at the 50 and 12 million year marks there was a significant drop in atmospheric pressure that would account for the drop in average temperature? We could speculate the reason for the pressure drop either through a series of asteroid grazing events removing atmosphere thus stripping a sizable portion of the atmosphere during the fly by OR the sequestration of CO2 by the oceans as the flora absorbed the CO2 from the atmosphere then stored it in methane hydrates on the ocean floor and the reefs built by corals. Wouldn’t a pressure drop better explain the variability of temperature? Once the density of air drops low enough the remaining air mass would be more easily influenced by other forces and events. In other words, a thicker atmosphere would swamp other influencing factors, than when it is thinner. I offer this thought experiment: take a container with 1/2 bar air, add a defined amount of energy, according to the gas laws it’s temperature will rise by a predetermined calculated amount. Take a second container with 1 bar air, add the same defined amount of energy as the first, according to the gas laws the temperature rise will be what? Half that of the former because the density is twice that of the former. Of course in this thought experiment, there is no other energy transfer events occurring. In simple terms any energy flux or cause of energy flux will have it’s influence dampened by the thicker density. In this example 1/2 of the effect of the flux was negated due to a density difference. It looks random to me. 14,000 years ago Holocene warming. Slow warming from the last ice age; large ice melt. 5000 – 3000 BC Climatic optimum Warm conditions; temperatures were perhaps 1 to 2 degrees Celsius warmer than they are today. Great ancient civilizations began and flourished. 3000 – 2000 BC Cooling trend; drops in sea level and the emergence of many islands. 1500 – 750 BC Colder temperatures and renewed ice growth, sea level drop of between 2 to 3 meters below present day levels. 750 BC – 150 BC Slight warming not as warm as the Climatic Optimum. 1100 – 1300 AD Little Climatic Optimum or Medieval Optimum Warm; warmest climate since the Climatic Optimum, Vikings established settlements on Greenland and Iceland. 1550 to 1850 AD Little Ice Age Coldest temperatures since the beginning of the Holocene. Populations die from crop failure and famine in Europe. More detail . One can just as easily make the argument for a 200 year climate cycle or for that matter anything that might come to mind which means there is no climate cycle per say. I do not like blanket general statements when it comes to the climate and this is why I try to show another side when it comes to the 1470 year climatic cycle. I think trying to assign a strict climatic cycle(the 1470 year climatic cycle) to a non linear, random, chaotic system such as our climate system does not reconcile to well in many instances although I will say one can make an argument for some sort of semi cyclic climatic variability( I even have) with the caveat of many exceptions to the rule. With all what I said I do believe in a semi cyclic climatic cycle which is subject to much noise, random extra terrestrial( asteroid impact/ super nova in vicinity of earth)/terrestrial events( large mega volcanic eruption ) and thresholds that may or may not be reached within this semi cyclic climatic cycle which makes it not set in stone to any degree of certainty. We can say 1470 years but with so many exceptions. In addition the phase of Milankovitch Cycles, Land -Ocean Arrangements, Ice Dynamics, Initial State of the Climate in general , and the Relative Strength of the Geo Magnetic Field, in addition to what I said in the above is going to influence in great degree how significant or obscure this semi climatic cycle is, that being 1470 years for lack of a better number. one last point is if we go even semi cold from here given the Little Ice Age just ended in 1850 AD what cyclicality be brought out to would explain this? I forget the degree and duration of time of solar variability the most important one is my opinion. Let me say the last two sentences again. One last point is if the climate should enter a cold period post 2020 ,given the Little Ice Age just ended in 1850 what climate cyclicality would account for this? I forgot to mention solar variability (magnitude/duration of time) is another factor that will influence how significant /obscure a given climate cycle may be. How effective the 1470 year climate cycle may be if it exist depends on all the factors I have mentioned in my previous post sent earlier today. It may depend on the accuracy of the planetary line-up with Earth. A four-way conjunction of Jupiter, Saturn, Neptune and Earth lining up with the Sun is quite a tall order but the numbers we have, plus actual evidence, show it’s more than a possibility. A small piece in the news section of Current World Archaeology 72 (Aug, 2015) (see http://www.world-archaeology.com) caught my eye – as these things do. Some 13,000 year old footprints of a man, woman and a child were found on the shoreline of an island off the coast of British Columbia – dating back 13,000 year ago (which is very nearly the Younger Dryas boundary), alongside a hearth and two cobble tools. They were made by people walking over grey clay which was then infilled by black sand and that preserved the footprints (we are told). The really interesting point then made is that this shows that specific places on the Pacific coast of Canada were used over a long period – and ‘sea level has been very stable in the region over the last 14,000 years’.